Beyond cleaning up the damage, there was the obvious problem of getting the government back up and running. After all, the President and Congress had to do their work somewhere. Fortunately, Madison was on top of it. Once the Senate returned to session, he had it relocated to a spot most Senators probably already knew well: Blodgett’s Hotel, a.k.a. the tavern down the street. 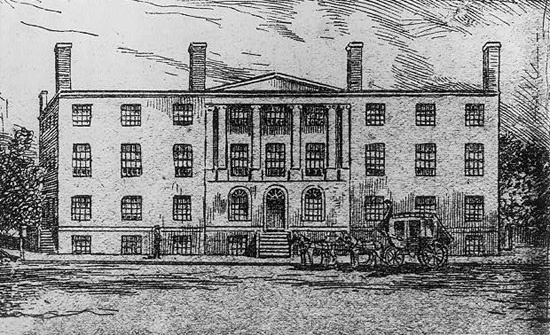 On September 19, 1814, the Senate moved into these “emergency quarters,” which was also home to the city’s first theater, a post office and the U.S. Patent Office. It was quite a large building, occupying the entire block between 7th and 8th and E and F Streets NW. The Senate’s new home had almost been a victim of the fires itself. Luckily, one man convinced the British that the property inside belonged to investors and thus should be left alone. 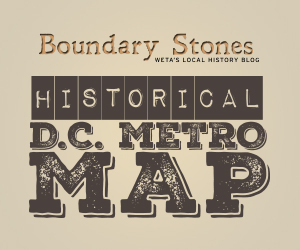 It worked, and thank goodness for it, or else who knows where Congress would have met… Or whether the District of Columbia would have remained the capital of the nation. After almost six months of deliberating, it was decided that the original Capitol would be rebuilt on its old site. Congress allotted $500,000 for reconstruction, and hired Benjamin Latrobe to oversee the project. Latrobe had previously been involved with the construction of the original Capitol building but that building had been largely designed by William Thornton. Now, given the opportunity to lead the reconstruction, Latrobe made some changes to the old design. The new Capitol building would far more spacious than the old one as a larger chamber and extra committee rooms were added. While construction was underway, Congress continued to meet at Blodgett’s Hotel for over a year, before moving to a temporary brick Capitol building that was hastily built on the modern site of the Supreme Court. The new and improved Capitol (re)opened in 1819. As it turned out, the days of Blodgett’s Hotel were numbered. In 1836, a servant inadvertently dumped hot ashes in a wooden refuse box and the famous building burned to the ground. Today, the Hotel Monaco sits on the site. It’s likely a much fancier establishment than Blodgett’s ever was. But it was never the Capitol of the United States. In the 1920s, Washingtonians dealt with the summer heat by going to the nearest beach... at the Tidal Basin. Back in 1939, filmmaker Frank Capra's feel-good "Mr. Smith Goes to Washington" inspired a vehement backlash from members of Congress. Back when the parking meter was a new invention, installing them on District streets caused a bitter controversy.